We’d love your help. Let us know what’s wrong with this preview of How We Came Back by Nona Martin Storr. On August 29, 2005, Hurricane Katrina made landfall in southeastern Louisiana, displacing half a million people and causing more than $100 billion in damage in the Greater New Orleans region. The nation wondered how the people of New Orleans could recover from a disaster of this magnitude, the costliest in American history. Within a few years of Katrina, hundreds of thousa On August 29, 2005, Hurricane Katrina made landfall in southeastern Louisiana, displacing half a million people and causing more than $100 billion in damage in the Greater New Orleans region. The nation wondered how the people of New Orleans could recover from a disaster of this magnitude, the costliest in American history. Within a few years of Katrina, hundreds of thousands had returned and were rebuilding their homes. How they have come back is, to say the least, something of a puzzle. 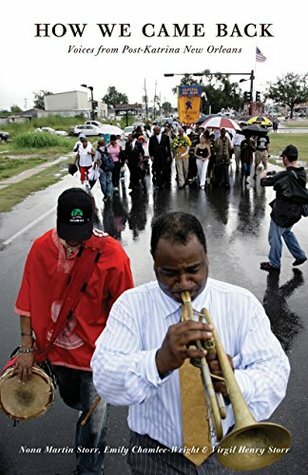 A decade later, this book presents 17 oral histories of Hurricane Katrina survivors from four diverse New Orleans communities. The oral histories explore how these individuals, families, and communities began to rebuild after the devastation. These testimonies show that communities can be surprisingly resilient in the wake of disaster, especially thanks to early and disproportionately large individual efforts. Why have some communities rebounded quickly while others have lagged behind? Even after accounting for obvious factors, such as degree of damage, median income, and flood insurance, much of the variance remains unexplained. What are the socially embedded resources that communities have drawn on to develop effective recovery strategies? Why, despite the commitment of significant government resources, have many of the official forms of assistance produced disappointing results? To ask other readers questions about How We Came Back, please sign up.